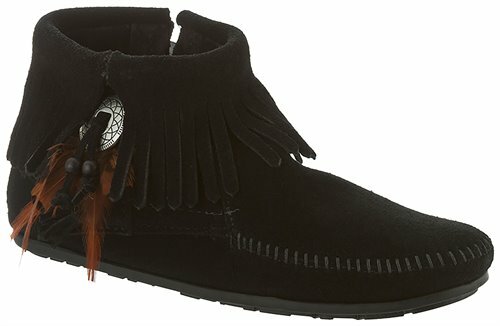 Southwestern styling with decorative feathers, beading, and metal concho detail, all in an ultra-comfortable ankle boot. Love them just what I have been looking for. Only issue is the side zipper on the left shoe does not go all the way down. This makes it difficult to get my foot in. It appears they stitched up a bit to far on that shoe. The booties are exactly what I expected them to be and are true to size ! This bootie is high quality. I love it, however it fits too narrow for me. I wear medium width. That is the only reason I must return it.